To make it even more compelling, it billed itself as a dice based dungeon crawl that can be played in about 30 minutes. It uses one deck of custom cards, a whole bunch of colored dice (DICE!!! ), and a few wooden bits to track things… and it packs a lot of fun into that small set of parts! 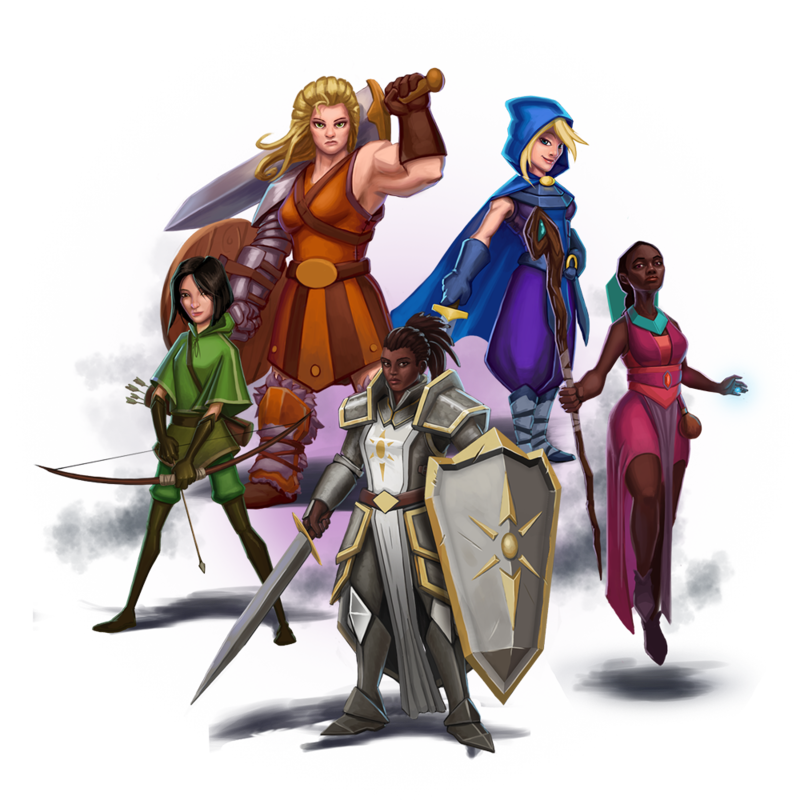 To start, each player takes a character card from one of the five classes. This gives them their starting skills and tells them how many dice of which kind they get. There are 3 main types of dice – Yellow/Strength, Pink/Agility, and Blue/Magic. There is also a fourth black Hero dice that can be used as any type. 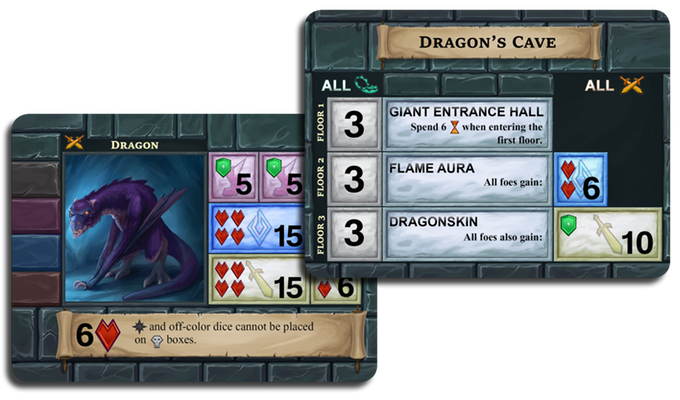 Players will shuffle the main deck and then deal four cards face down – these are the Doors available to the heroes. The players can then take actions as a group – but each action requires them to “spend time” by discarding two cards from the deck. 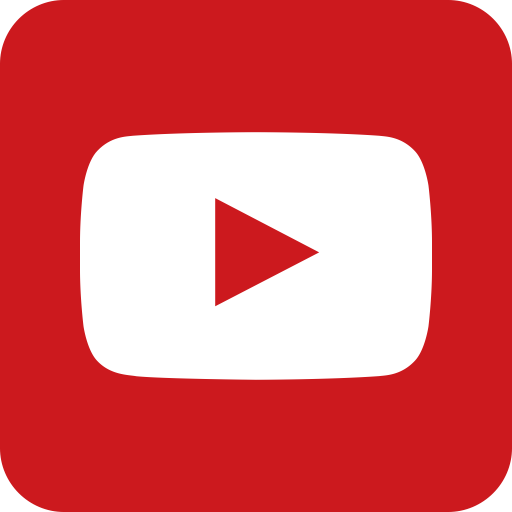 These actions are to either to Enter a Room – I.E. turn a card over and encounter the obstacle/enemy on the other side, or Explore, which is dealing out new doors face down. If the players Enter a Room, the players will then roll their dice and use skills to try to fill enough boxes on the encounter. Boxes with shield icons must be filled first. Once all dice that can be placed are placed, any unfilled boxes are the “damage” that is done to the players. Sometimes the damage is more time, which requires discarding more cards, other times it is damage to a hero’s health. There is also a “floor” tracker card that has boxes that must be filled on each encounter. Once the encounter is over and damage is assessed, the players can take the card as “loot”. This is where things get interesting! 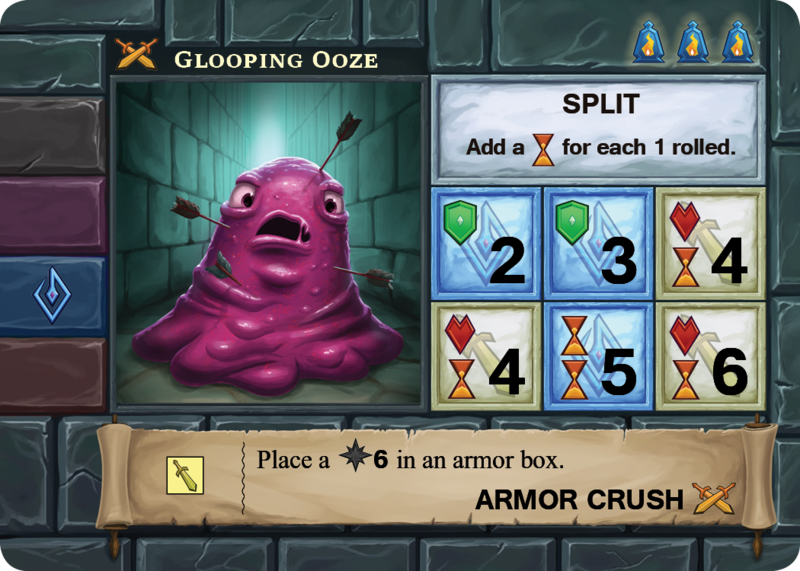 Each card can be used in one of multiple ways – as an Item, which gives the player an additional die of one kind (and sometimes even an additional heart of health), as a new Skill attached to a player, or as Experience points. 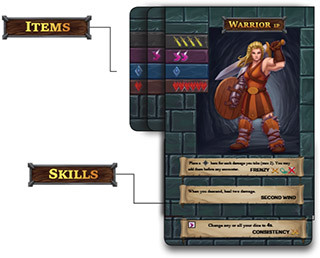 The number of Items and Skills a player can have are limited by their level, which can be increased by Experience. The card is placed either under the character card or floor card depending on what it’s being used as, so table space usage is kept to a minimum. Players continue exploring, entering doors and encountering obstacles until the deck runs out, at which point the deck is reshuffled and the players “descend” – they reveal the next layer of the floor tracker card, which means that each encounter is a bit harder. The floor card also sometimes has ongoing effects that can make the game more difficult as the players descend floors. Once the players descend from the third floor (I.E. the third time through the deck) they turn the floor card over to reveal the Boss. The players must defeat this Boss… or die trying. If you are looking for a deeper story-driven experience, like a DM-less RPG, this isn’t really that game (nor is it meant to be). 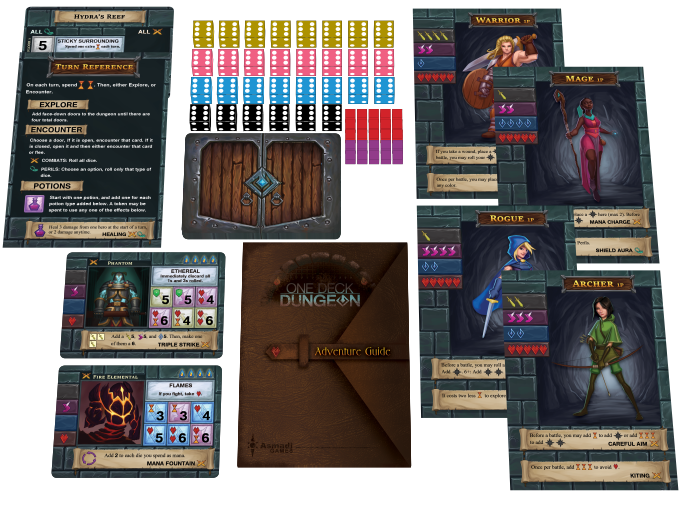 What you do get is a quick card/dice dungeon crawl with tons of great co-op interaction. 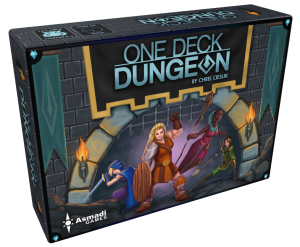 One Deck Dungeon is delightfully puzzley, with each player trying find the right combination of their Skills and die to fill the most boxes. Each character has a one player or two player side and the game works well as a one player puzzle, but it really shines as a two player game. Some of the rules really help augment the co-operative aspect of the game. For instance two of any unplaced dice, from whichever player, can be combined to make a black dice of the lower of the two numbers – for example, you can combine my pink 2 and your blue 4 to make a black 2, which can than be used on any color box. This is particularly useful when one player has a bad roll or has a couple left over dice of colors not being used. 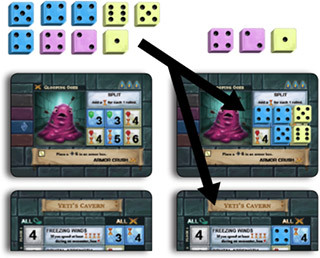 Many of the skills also provide aids to the other players such as a starting skill that allows another player to increase one of their Yellow dice by 1 point. All this combines to make a game that has each player invested in the action at every point. Since only one card is taken as loot after each encounter, there is a subtle negotiation that happens to figure out who should get it as what, I.E. “Well it’s a magic item and I could really use another blue die, but the skill is probably effective for you…”. Like all co-ops, who you play with will determine how smoothly these interactions go. The multi-use loot system is a great design, though getting all the cards to stay lined up and neat can be a bit frustrating (though that’s probably more an issue with table surface than a problem with the cards). The additional choice lends a deeper level of strategy to the overall game and the character progression feels great. Many Co-op games suffer from an Alpha gamer issue, where one player tries to dictate actions and solutions to other players, but because of the unique combination of skills and die rolls for each player, that problem is minimized here. One possible detraction for some may be that ultimately the game is dice based and so reliant on luck. The skills and co-op nature of the game really do help to overcome this problem for the most part. A particularly bad roll by both players can be painful early on, but in later parts of the game, the skills and the general number of dice, make this problem nearly non-existent. In fact, in can be particularly fun to see how a whole bunch of “useless” 1s can be turned into powerful combinations. One minor drawback we found was that in later levels, it can almost feel like a race to fill boxes because the characters abilities outstrip the challenge of the encounter. It’s a bit frustrating to have a great roll only to find that your partner has already basically filled everything. The game can be played with up to four players using two sets of the game and it works surprisingly well in that mode, where the players turn up two doors per turn and then take on each door with two players per door. It’s interesting to see how skills combine with each new pair and the overall effect is very fun, though the greater number of players can make the loot negotiation a bit more difficult. They’re all girls! And they are dressed like they mean business! The game designers made the somewhat bold decision to have all the characters be female (which garnered some controversy at the time). 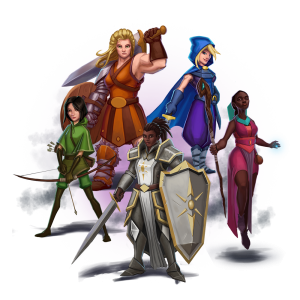 We love this decision and even more, we love the fact that the women are dressed in full armor – they look like competent warriors rather than the “chain-mail bikini models” that tends to be more common in some fantasy settings. The game also has a sort of “Legacy” mode, where your end score translates into points on a character track that can open up bonus traits for future plays. This adds even more replay to the game. Asmadi Games continues to issue additional characters and bosses to expand the base game play and a new stand alone expansion has just been announced! Keep an eye on Kickstarter for more info on that as well. 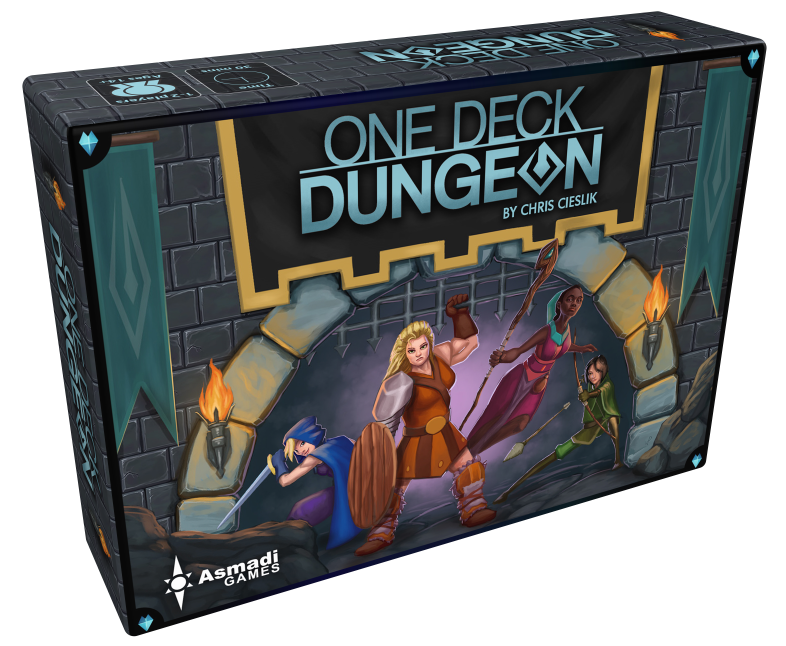 If you are looking for a fun slightly complex, but still light, portable co-op game that can played in 30 minutes, we definitely recommend checking out One Deck Dungeon!